I’m a single mom of a 10 yr. old boy, an entrepreneur and an Intimacy Expert. In the early days, I noticed if I didn’t sleep until 7am and woke when my son got up at some ungodly hour, I was cranky, crunchy and impatient. So I gave my son a digital clock when he was 3 yrs. old, and told him I was looking for ‘Patience & Kindness’ and if he let me sleep until seven-zero-zero, he’d be my hero and I’d give him patience and kindness! Day one: not good. At 5:30am I walked him back in her room with no eye contact or words. Miffed he screamed a bit then went back to sleep. I use my ‘me’ time for sleep, prayer, journaling, self-pleasuring, email or even some exercise or chats on Skype with my girlfriends on the other side of the planet. I love that I’m sane for my son, fueled up as a mom, yet also that I’m teaching him to create systems that work for him. He now tells me when his bucket is empty and I honor him when he needs time for him. Remember bottom line, “When mama’s happy, everybody’s happy.” And know that when you’re full, you’re more than patient and kind, you’re an inspiration. 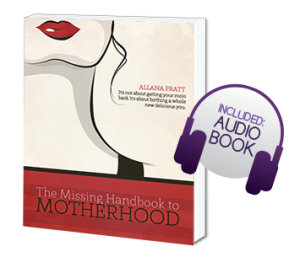 For even more delicious tips, check out The Missing Handbook to Motherhood… It’s not about getting your mojo back, it’s about birthing a whole new delicious YOU! It specifically addresses how moms have different challenges than “regular” woman or working women and thus different solutions to bring back patience, playfulness, power and peace. Be sure to check out the section on single moms and their challenges, because I know firsthand about being a victim in this department.